It's been challenging, in the absence of OOTB Software Content Management (SCM) system within ThingWorx, to track, maintain code changes in different entities or to roll back in case of any entity is wrongly edited or removed. Though there's possibility to some extent to compare the differences i.e. when importing back the entities from the Source Control repository in ThingworxStorage. However this approach itself has it's own limitations. Note : This is not an official document, rather more of a trick to help workaround this challenge. 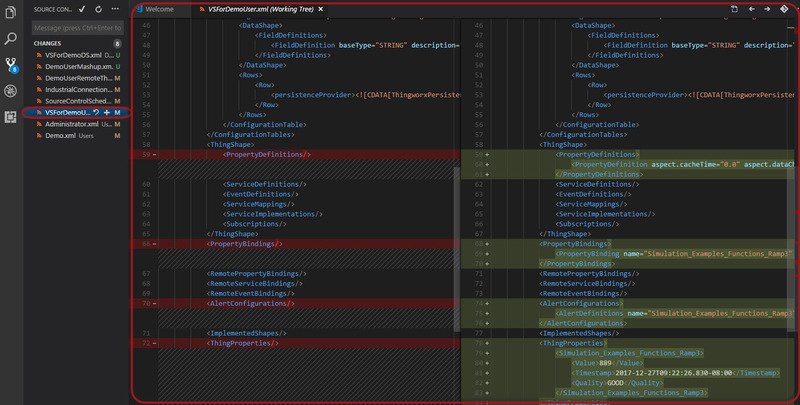 I'll be using following components in this blog to help setup a workable environment. First two components i.e. 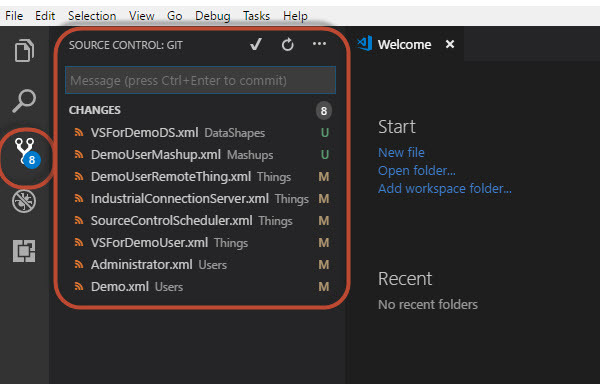 Git & VSCode is something I preferred to use due to their ease and my familiarity. However, you are free to choose your own versioning platform and IDE to review the branches, commits, diff, etc. or simply use GIT Bash to review the branches and all related changes to the code. Navigate to the \\ThingworxStorage as this is the folder which contains the path to the \repository folder which in turns have SystemRepository folder. Note : Simply remove the folder/file from the .gitignore file if you'd like that file/folder to be tracked within the Git repository. 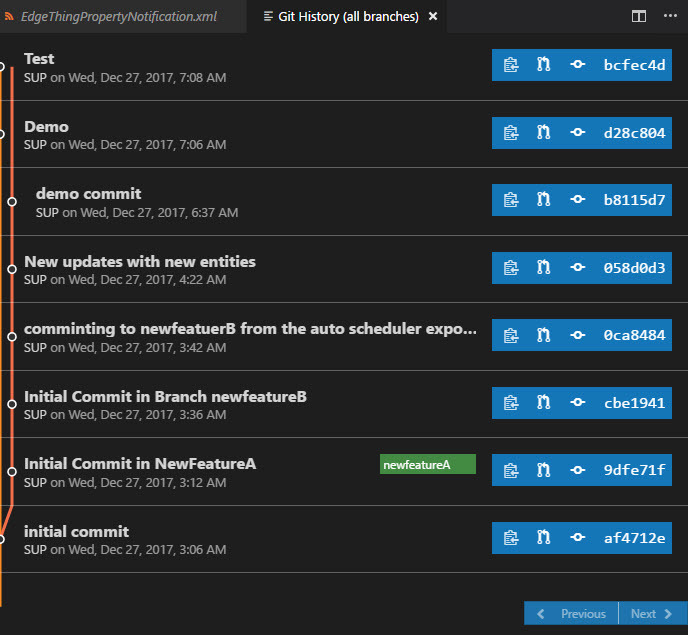 Following commands have been issued in the Git Bash which can be started from Windows Start > Git Bash. Then from the Git Bash navigate to the ThingworxStorage/repository folder. This may or may not return list(s) of files/folders that are not tracked/un-tracked. While issuing this command for the first time, it'll show that the repository and its content i.e. SystemRepository folder is not tracked (file/folder names will likely be highlighted in red color. $ git config --global user.name ""
This will add all the folders/files that are not ignored in the .gitignore file as we created above. This will create a new branch with that name, however to switch to that branch checkout command needs to be used. 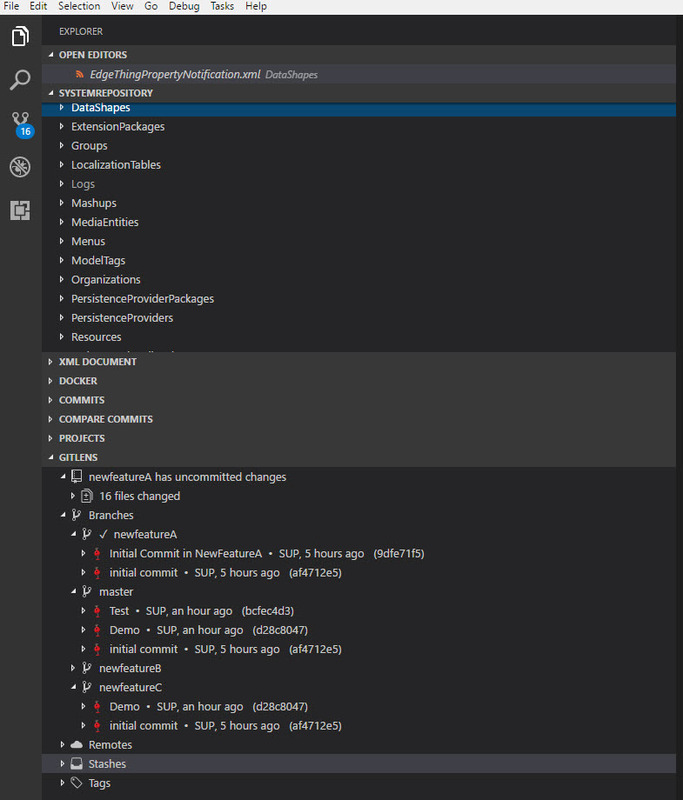 $ git commit -m "Initial commit under branch newfeatureA"
To install VSCode refer to the Setting up Visual Studio Code. This will cover all the platforms which you might be working on. Here are the list of extensions that I have installed within VS Code to work with the Git repository. Service is only taking path & repositoryName as input. Of course, this can be updated based on the type of entities, datetime, collection type, etc. that you would want to track in your code's versioning system. 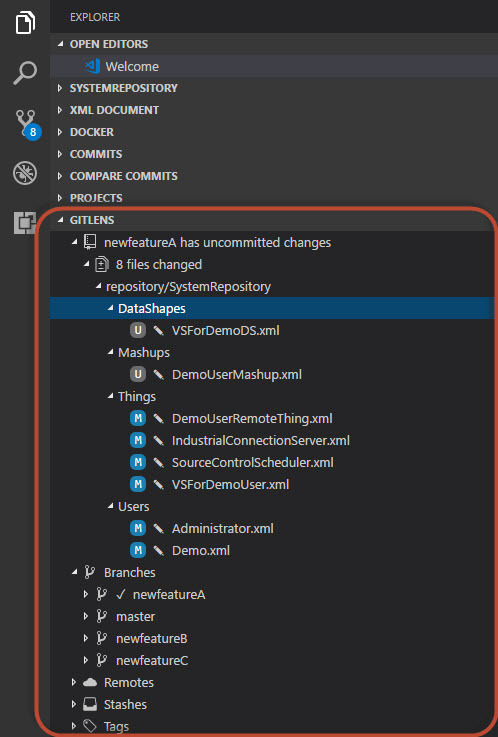 Changes marked with "U" are new entities that got added to the repository and are also un-tracked and the changes marked with "M" are the ones that are modified entities compared to their last commit state in the specific branch. We have used the Template "SourceControlRepository" to create a new repository. We use SourceControlFunctions to export using the service ExportSourceControlledEntities. This works fine and we can commit that directory to a git server. However, when we delete an object (thing) in Thingworx, the export function does not delete the thing from the repository. This is a problem because when we want to import the things, the deleted Things will be imported back again. What is the best practise, should we purge the SourceControlRepository before exporting? If so, how? The SourceControlRepository does not seem to have any such functions. Appreciate your feedback. I think we already discussed this point under your new question so I hope that helps, if not please feel free to bring that up.